WASHINGTON (Sept. 05, 2008) -- Secretary of the Army Pete Geren recently took time to reflect on the progress the Army has made in the 25 years since the beginning of the Army Family Action Plan. "This is an important opportunity for us to look back on 25 years of the AFAP," Geren said. "The Army over the last several years has been stepping up to this challenge and doing everything we can to provide Army families with the quality of life that is comparable to the quality of their service. But we recognize there is more to do." Secretary of the Army Pete Geren recently took time to reflect on the progress the Army has made in 25 years since beginning of the Army Family Action Plan. The secretary, Delores Johnson, director of Family Programs for the Family, Moral Welfare and Recreation Command and the spouses of several Soldiers met Sept. 4 to answer questions for military bloggers about how the Army cares for Soldiers, their families, and veterans. 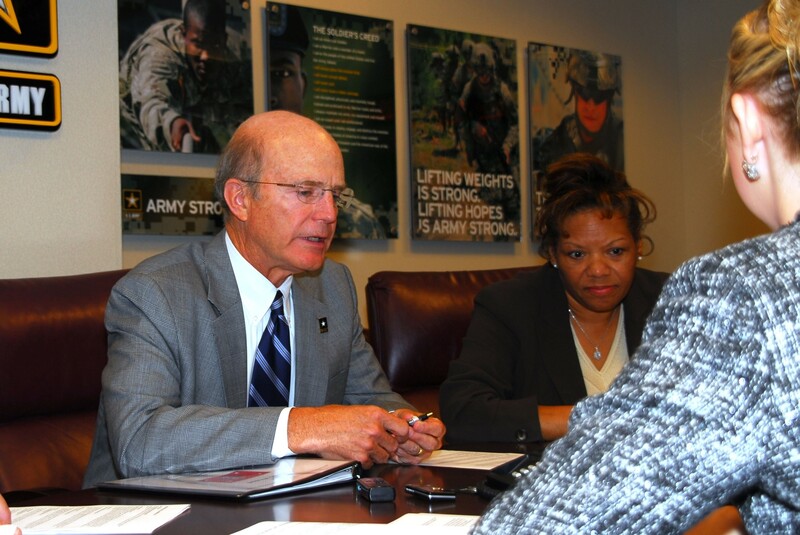 Delores Johnson, director of Family Programs for the Family, Moral Welfare and Recreation Command; Secretary Geren, and the spouses of several Soldiers met Sept. 4 to answer questions for bloggers about how the Army cares for Soldiers, their families, and veterans. Bloggers asked about how the Army helps Soldiers who are geographically separated from Army or Veterans Administration treatment facilities. They asked how the Army aids families of Soldiers afflicted with post traumatic stress disorder; how the Army might deal with the influx of Soldiers who could come back from Iraq and Afghanistan if the war were ended today; and how the Army could better include parents of Soldiers in the Army family. Some veterans are geographically separated from the military or VA facilities that can provide them medical services, if needed. Becky Pillsbury, wife of Maj. Gen. John Pillsbury, said a program called "Still Serving Veterans," based in Huntsville, Ala., aims to help those veterans connect to the services they need. "We travel to them," said Pillsbury of the program. "We wrap our arms around the entire family and we provide counseling, and have gotten them into the VA system. And it used to be six months; we now have it less than a month." Pillsbury said the program helps provide those geographically separated Soldiers with getting their homes handicapped accessible, their cars handicapped accessible and even helps them get college educations completed in their own homes. The Army helps Soldiers returning from the war on terror who are suffering from PTSD or traumatic brain injury. But often, military spouses need assistance as well. Sometimes just to learn to better deal with afflicted spouses. "Through their Family Readiness Groups, we can provide information and training on what the surgeon general has developed, in terms of Battlemind," said Johnson. "So, I think the first strategy is to be able to take some of those courses that are offered through FRGs, so they understand a little bit more about what kind of injuries are the result of the war -- whether that's mild brain injury or PTSD, because these are conditions that we've not -- at least this generation of spouses -- had to face in the kind of volume that we're facing it now." Johnson said it's important for spouses to understand what mild brain injury is, and for spouses to be able to identify and to play a key role in encouraging their Soldiers to seek assistance with PTSD, if needed. Some three quarters of a million individuals have deployed to support the global war on terror, some more than once. Right now, nearly 150,000 -- from all branches of the military -- are deployed. Were they all to return at once, systems in place now for dealing with their medical and psychological needs would be strained, Geren said. "If the war were to end tomorrow and all of a sudden 150,000 Soldiers, Sailors, Airmen, and Marines came home, there's no doubt it would stress the system in a number of ways," he said. "But the system is being tested now and we're shaping the system to meet the needs. We're also looking at the next 20 years as an era of persistent engagement, persistent deployment, and persistent conflict -- so we're trying to shape the Army to meet the needs of an Army that is consistently deployed." The secretary said the Army must accept what is the status now -- so many deployed -- as the "new normal" for the service. "We're not going to go back to the 1990s and a garrison-based Army," he said. "We're going to continue to be a deployment Army -- an expeditionary Army -- and that's causing transformation of the entire Army in how we educate our Soldiers." Some of that transformation, for instance, includes how to handle health-care needs of Guard and Reserve members that are so geographically dispersed when they return home. Some Soldiers have no families -- except for their parents. Military mothers and fathers want to be more involved in their Soldier's lives, one blogger said. Parents can become part of a virtual Family Readiness Group to stay better connected to their Soldiers and the military family, said Johnson. And many FRGs in the Guard and Reserve, she said, are now run by parents. "Those parents have tremendous insight," Johnson said. "They have a lot that they have told us about what needs to happen, because they're the ones closest to the Soldier that's deployed."